This year, for the first time, ELNET-Germany and ELNET EU & NATO organized a joint delegation to Israel and the Palestinian Territories. Ten young leaders working for parliamentarians in the European Parliament and the German Bundestag joined ELNET for a five-day trip to Israel from 16 – 20 June 2018. All of them work with a connection to foreign and security policy, the Middle East, as well as cyber security and digitalization. The majority visited Israel for the first time. The group went on a tailor-made five-day trip in order to meet various representatives from the Israeli ministries, the Knesset and the private sector. The young leaders had various political meetings to better understand Israeli internal political challenges and Israel’s foreign policy approach within the region. The delegation also visited a civil society group at a Southern Moshav to better understand the challenges the communities have to face at the border region. Political meetings included exchange with Amir Ohana(Likud) from the governing coalition and Nachman Shai (Zionist Union) from the opposition as well as discussions with Maj. (res.) Arye Shalicar, Head of Foreign Relations, Ministry of Intelligence. Accompanied by Col. (res.) Peter Lerner, military expert and former IDF spokesperson, the group also went on a strategic security tour to the border with Gaza. He explained the challenges at the Southern border and its development over the years, focusing a lot on the timeframe since Hamas took over in 2006. Afterwards the group also visited the Erez border crossing at the North of the Gaza Strip. At the Cyberspark in the Negev—the Israeli Cyber Innovation Arena that connects the Israeli National Cyber Bureau of the Prime Minister’s Office, Beer Sheva Municipality, Ben Gurion University of the Negev, leading companies and the Israeli Defence Forces and the Cyber Week in Tel Aviv the participants spoke about Israel’s role cybersecurity. 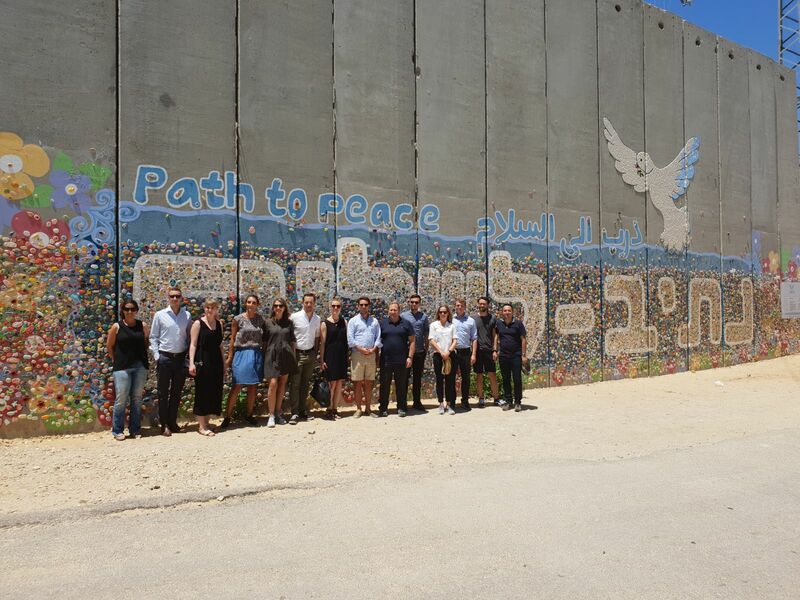 When visiting Ramallah, the young parliamentary staff members had the chance to get a glimpse of life in the Westbank. With a young Palestinian entrepreneur, they talked about social life, political boundaries and doing business in the Palestinian territories. This meeting was followed by a political talk with PLO Communications advisor Xavier Abu Eid. Security briefing with Col. (res.) Peter Lerner at the viewpoint Givat Appaamonim. Visit at Cyberspark in Beer Sheva. Meeting with Member of Knesset Nachman Shai (Zionist Union). Meeting with Member of Knesset Amir Ohana (Likud).